Saint Petersburg - one of the most beautiful and interesting cities in Russia. A little more than 300 years flaunts this city on the Gulf coast. Many people dream to get Peter and admire the Palace square, to see the white nights and raising of bridges. Visit the Hermitage - the largest in Russia and second only to few in the world Museum of art, which each year receives more than 2 million people. Here you will find 365 halls of the main Museum complex that can not be ignored even for a few days. Having visited St. Petersburg at least ten times, in the Hermitage you will always find something not yet seen. A ticket to the Museum costs about 400 rubles, but schoolchildren, pensioners and students visit it for free, 200 rubles for a ticket to take pictures. The Hermitage works from Tuesday to Sunday. 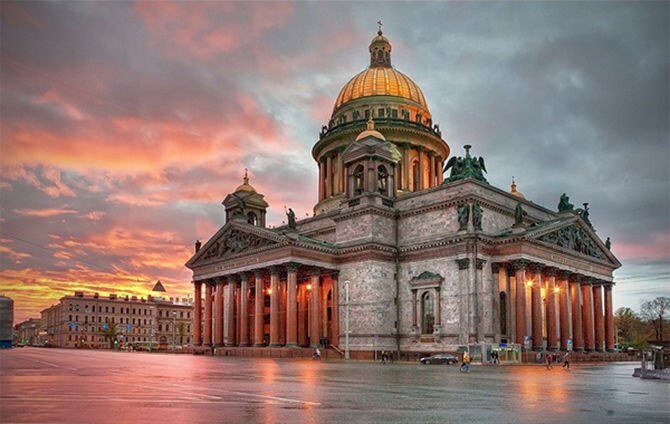 Climb to the colonnade of St. Isaac's Cathedral, if you are in Peter may 1 through October 31. You will be able to climb 43 meters high and have a panoramic view of Saint Petersburg in the photographs, and his eyes. Especially beautiful panorama in summer white nights. Tour is available from 10 am to 22:30 hours, cost 250 rubles, children, students, pensioners, disabled people have the benefits. Take a trip to Peterhof, the country residence of the Emperor Peter. This magnificent parks, beautiful palaces and fountains. Visit the tour of the caves, view the fountains from the inside and find yourself at the site of the famous Samson, tearing the lion's mouth. Fountains include in the may holidays, and shut down in the fall, the opening and closing of fountains arranged a Grand festival. Look in the Mikhailovsky Park and castle, where he lived and said goodbye to the life of Tsar Paul I. It was Paul doing sketches of the castle, he is very fond of this Palace even when he appeared only in his dreams. They say that the castle is still haunted by Paul which many of the visitors notice in the halls. The cost of tickets varies from 30 to 300 rubles. Works Palace every day except Tuesday. View Peter on the bridge. It's a fascinating spectacle for which you do not need to pay. Although, if you buy a tour on a boat, for a small fee you will be able in one night to see how open 5-7 bridges over the Neva. Bridges start to breed after midnight, and look at it, certainly nicer in the summer when the street is not so cold. Remember that bridges are reduced to only 3-4 o'clock in the morning, watch the bridges near the hotel or your accommodation. Saint Petersburg - a city-changing weather. Even if the sun is shining and the sky clear blue should take an umbrella and a windbreaker: it's possible that after a couple of hours the rain will come or the wind will blow from the Gulf.